Using sophisticated large-scale production facilities, we offer manufacturing unparalleled by competitors. UACJ is the world's leading comprehensive aluminum manufacturer. The source of our competitiveness is the manufacturing capability we derive from our diverse lineup of advanced production facilities. 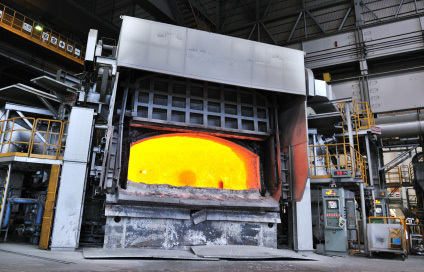 We use our industry-leading large-scale production facilities to make large-sized products unavailable elsewhere, covering everything from hot- and cold-rolling to extrusion, casting and forging. Our mass production capacity offers an unparalleled level of efficiency. 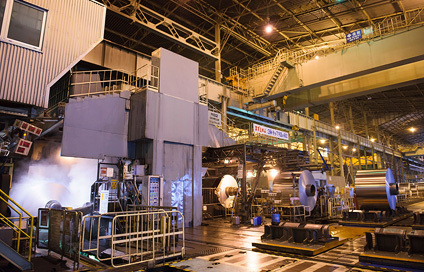 The Fukui Works, one of our principal production facilities, has a world-class large-scale hot-rolling line 400 meters in length and 4.3 meters wide. This line uses AGC (automatic gauge control) to control the thickness of the sheet automatically for high-quality rolled products. 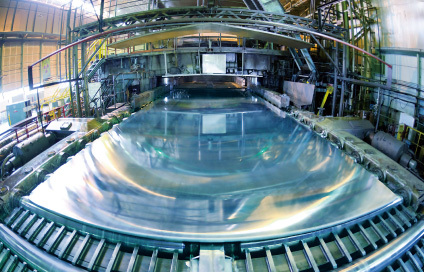 These products are then used to create ultra-broad and highly uniform thick aluminum sheet used in LNG tankers, aerospace applications, and elsewhere. 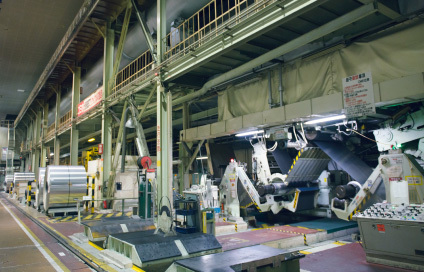 Nagoya Work's cold-rolling process can produce large aluminum sheet coils of over 2m in width and 2m in outer diameter. 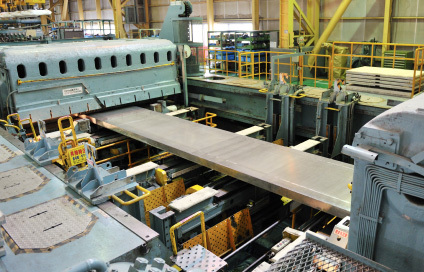 Using computer-controlled coil carrying systems and in-house developed control systems, Nagoya Works combine a high level of accuracy with world-class speed, producing aluminum sheet with thickness that is consistent throughout its length and with minimal crosswise warping. The quality of flat rolled aluminum products is determined by the degree to which impurities can be removed and high-quality slab (ingots for rolling) produced during the smelting process. We have installed the latest large top-charge smelting furnace at the Fukui Works, to produce industry-leading products. This line is one of the largest in Japan and is capable of producing slabs up to 2.3 m wide and 10 m long, weighing 32 tons. After aluminum sheet has been rolled and strengthened through quenching, it is placed in a stretcher for stretching and straightening. Generating up to 5,600 tons of tensile force, the Fukui Works' stretcher is one of Japan's largest, and provides unshakeable quality. The Nagoya Work's coating line for beverage can lid materials is the world's first high-speed integrated line, offering everything from straightening to surface treatment, coating and painting, surface inspection, and defect marking of aluminum coil sent from the cold-rolling line. Because the materials are used for beverage cans the entire 1km line is installed in a clean environment, and has earned praise from users as number one worldwide in quality. 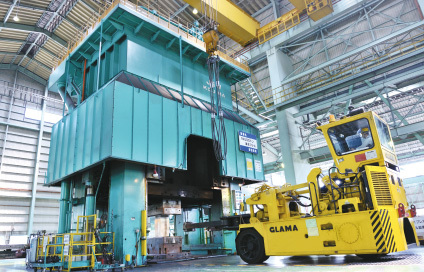 Our forging and casting works features Japan's largest forge press, at 15,000 tons. With one of Japan's top production systems, we meet large-scale forged aluminum product needs, such as those for airplane engine parts, and liquid-crystal and semiconductor manufacturing equipment.